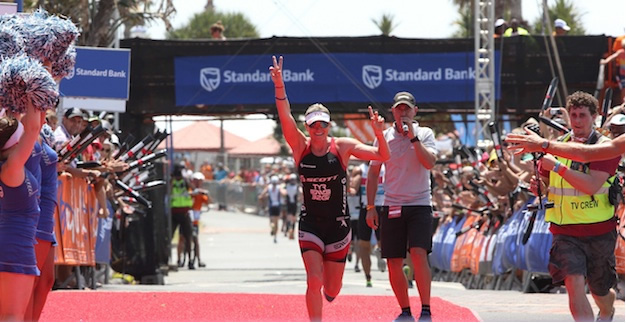 It was 'business as usual' in Buffalo City, East London today for Ironman 70.3 South Africa - where Great Britain's Jodie Swallow won her season opener for the fifth consecutive season. It was a great day for British ladies in general, with Susie Cheetham and Parys Edwards making a podium sweep of the top three positions. While Jodie's partner James Cunnama was unable to race due to injury, there was still plenty to cheer about for the home fans in the absence of the defending champion. 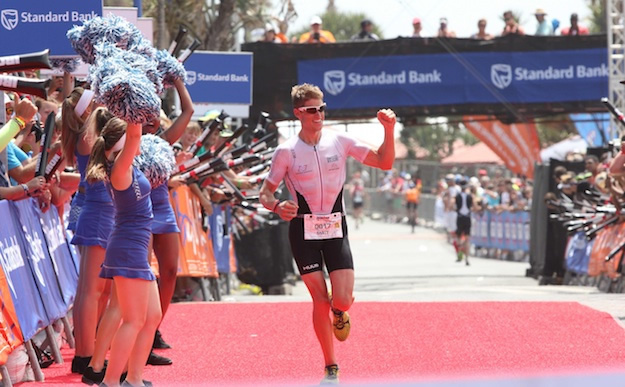 Ironman Wales winner Matt Trautman and Stuart Marais (fourth last year), took top spots for South Africa, leaving Uplace-BMC member Bart Aernouts (winner two years ago), to take the final place on the podium. Swallow powered through the swim in 24:41, which gave her a two minute lead over Lucie Reed (CZE) and Emma Bilham (SUI), a real measure of her form in the water right now. That lead was extended further on two wheels, riding more than five minutes faster than the next best split of Cheetham, bringing her in to T2 with a huge lead. In true Swallow style though, no taking it easy to the finish line as she then added the fastest run of the day for a close on 11 minute margin of victory. Swallow truly is a class act, and her 2014 season went - in my opinion - a little under recognised when you consider she took third (5150), second (70.3 World Champs), fourth (Kona) and third (Challenge Bahrain) in the four biggest non-drafting events of the season. A great start to 2015 is, I hope, a great indicator for 2015 where she will certainly have sights on the top step of the podium in at least one of those races. Cheetham is looking to qualify for Kona this year, and following her Ironman debut in Barcelona last October, will have added a nice number of points towards the qualification requirements of that goal. Edwards will also be pleased with another podium, having ended 2014 with a win at the Laguna Triathlon and second at Challenge Phuket a week later. The swim saw a South African trio reach T1 with a clear lead over their chasers in the form of Trautman, Marais and Kyle Buckingham. Buckingham would fall off of their pace slightly on the bike, leaving a head-to-head at the front of the race. Losing a couple of minutes on the swim, Aernouts was unable to close the gap on the 90k out-and-back bike leg, and actually lost another minute and more - even with his running legs, it would be a tough ask to win. 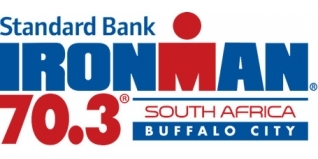 On the run, and Trautman would prove to be the strongest, his 1:16:49 bringing him home to his first Ironman 70.3 victory. Marais ran strongly too to take second, leaving Belgian Aernouts a distant third.